This week did not go so well. I was rather tired at the start of the week but recovered in time to do my hard intervals on Wednesday. I then got a cold on Saturday which meant I was not able to do my long run on Sunday. Still, as I type this on Sunday evening, I am feeling much better and looking forward to my trip to Ireland on Thursday and all the running I will do there. Monday, as usual, was a rest day so I did a lot of walking and little else. Tuesday I got up early again and did my 8km easy run. I still had no pain in my right hamstring so I was feeling confident to Wednesday’s hard intervals. Harrisson came along just as I was warming up and gave me lots of encouragement throughout the workout. It was not a very hot night but it was very humid and I was soon sweating profusely. I managed to do the 400ms in time and then started on the laps. I completed the first in 5:23 and the second in 5:27 but after that things started to get hard. Lap 5 was 5:32, just outside the 5:30 target, and when I started the sudden death I could only hold the 4:10 place for 400m. Harrisson said that we would call this a benchmark and try to improve on it going forward. I managed to drag myself up early again on Thursday morning and do my easy 8km before work. Again it was a beautiful morning and it was good to get along the Tamagawa. Friday I had to leave early for a business trip to Hamanako and I could not get any runs in. On Saturday, I got up early and met my colleagues for a 6am run around Hamanako. It was a gorgeous morning and we had a great run. That day a massive concert called One Rock was taking place around Hamanako and we ran into thousands of kids queuing up at 6am to gain access for a concert that was staring at 3pm. Now that is dedication. Unfortunately I caught a cold either out on the run or in the air con at night and for the rest of the day I was either sneezing or blowing my nose. At 7pm, I realised that I would not be able to make the long run on Sunday and told the people that I was to meet that I would have to take a rain check. On Sunday I spent most of the day in bed trying to get rid of my cold. Around 5pm I started to feel better but did not get up and run as I decided that I needed to get back to full strength before I started to do anything. Week 7 was an easy week where I recovered from the previous hard 6 weeks and also took care of my sore hamstring. I did one hard workout and 4 easy ones and saw my weight drop another kilo as I continued to avoid the snack vending machine at work. Monday was a rest day and I took it easy and continued to apply Tiger Balm to my leg. On Tuesday Harrisson asked me to just do an easy run with some strides to judge if my hamstring had healed sufficiently to do a hard workout on Wednesday. That morning I had seen the best RHR and HRV in a while and I felt very rested. The run itself went well so we decided to give the hard intervals a proper go the next day. I found the description of Wednesday’s workout a little hard to understand. (2:22 total time), 3min rest (the rest comes only after you’ve done 3 continuous laps). I e-mailed Harrisson several times to make sure that I understood what he was asking. It seemed that I did understand. He was asking me to do back to back intervals are different paces and with no rest. The key point was that the second interval was at my race pace of 4:30/km so he was training me to run at this pace on tired legs. I had a real life event that evening so I got up at 5am on Wednesday and headed over to the Tamagawa river.I won’t lie, it was very tough and I never made the pace for the 800m interval. I did however make it for the seven 600m intervals which was of some comfort. My hamstring was sore from the start but it did not get any worse so I get going. Along, with the soreness, it was very hard to run all those intervals without a drink. I was running up and down the Tamagawa river and stopping to rest at different locations so there was nowhere to leave a bottle of water. By the time I was running the 6th and 7th lap by mouth was completely dry and vigorously rubbing my tongue off the insides of my cheeks to try and generate some saliva. It was not a really hot morning, but it was very humid and I was drenched in sweated when I finished. Normally I won’t buy a drink after a morning workout but this time I could not get to the vending machine fast enough and the Postonic Water never tasted so good. As my hamstring had been a little sore on Wednesday, Harrisson told me to take Thursday off. I only had easy days left and he wanted to see my leg settle down before we started the next cycle the following week. I continued to apply Tiger Balm to my leg and by Friday night it was feeling OK again. Even still, I just went out for an easy 8km MAF run with no strides. Everything went well and I reported back to Harrisson. I told him that I might not have time to do a long run on Sunday and that I wanted to do it on Saturday morning. The schedule was for 20 ~ 25km but he told me, in no uncertain terms, to keep it to 20km to make sure that there was no impact on my hamstring. It is now getting bearable to run in Tokyo in the mornings although the afternoons are still too hot, and when I headed out on the Noborito loop at 6:20am it was only 25 degrees. It felt like a good temperature to run in, but 4 months ago it would have killed me. I guess that this is what Philippe means by temperature adaptation over the summer. The only purpose of this run was to get through it without soreness and I managed to do that. So far I have only felt the pain in my hamstring when doing hard intervals and I am hoping that that is now going away. I got back from the run and reported to Harrisson that I was fine in soreness department but my legs were feeling tired, although I had had a good night’s sleep the night before. So what are Variable Strides, I hear you ask. And I had asked myself the same question. Apparently they are strides until it just starts to feel hard and your breathing starts shooting up. I am not sure that I did these correctly as I am no good at this subjective feeling stuff and I may have run them longer that I should have. I much prefer to be told to run a distance, or a time, or a pace and I concentrate on that. Regardless I did all 6 strides and had not soreness. I got home and reported to Harrisson that everything was fine except that I was still feeling tired, despite getting 7 hours in the scratcher the night before. He said that he had been looking at my log on myfitnesspal.com and that he was wondering if I was getting enough protein. Normally I was recording 20g per day when it really should be 70g. Of course vegans and vegetarians always laugh at people who say “where do you get your protein” as we do not believe that there is any shortage of protein in the world today. However, you cannot argue with how you feel and if you are tired for no reason, you should try to do something about it. Except kill an animal who never did anything to you. and the had a good old fashioned vegetarian lunch when I got back. It is hard to believe that Week 6 of my training has come and gone. That means that I have completed the first 1/3 and there are 12 weeks remaining. Sometimes I feel that I have not gotten started and other times I feel that I have been doing this forever. Week 6 was a difficult week in that I got slightly injured and I was not able to complete all the planned workouts. We had to judge them on a day by day basis and reduce the intensity for the second half of the week. I am now hoping that I have avoided a big injury and that I can get back to normal training soon. On the good news front, Harrisson has been helping me with my diet and I have seen my weight begin to drop again. Now if I can stay away from the vending machine in work, it might continue like this for a few more weeks. Again Monday was a rest day but I did not have the energy to do anything when I got home from work so I just rested. It felt good. Tuesday was an easy run and as I had an appointment that evening, I got out early and did it before work. As the temperature has started to get cooler in Japan, there are a lot more people out early in the mornings exercising. Not as many as Hanoi at 6am on a Saturday, but still quite a few. I was pleased to keep my cadence high, even if my heart rate did drift above 140. I managed to keep the pace close to the desired value for the half of the workout but it started to drift again in the second half. I nearly got the pace back up for the first of the three 400ms but as I was ramping up my cadence at the end of the second 400m, I felt a little twinge in my right hamstring. I knew it was no good but I still managed to finish that interval a little faster than the first one. As I was gasping for air beside the track during my 45 second rest, I evaluated the situation. I knew that I would not be able to run that hard for the last interval and I considered stopping the workout there. In the end, I just ran it slower, finishing 6 seconds down on the second interval. When I got home I texted Harrisson and we decided to take a complete rest on Thursday and see how things were on Friday. I had planned to run the Rainbow Bridge with some friends, but as my leg was still sore I just rested. I went out before work on Friday morning and tested my leg with the same easy run I had done on Tuesday. There was still some pain there but not enough to make me stop. I went home and reported the situation to Harrisson. We decided not to do anything hard and test it again on Saturday. On Saturday I was bringing the boy to his first competitive rugby match so I got out early and gave the leg another test by increasing the distance to 12km. My leg was not perfect but it was clearly better than Friday and I took that as a good sign. Harrisson suggested to do 60~90 at MAF with some strides (if there is no soreness) on Sunday and I headed off to a day of standing around in the rain watching 12 year olds trying to get hold of a rugby ball. I went out at 8am for the third test of the leg (And I apologise if you are bored hearing about this. I will try to write less about it next week. I really don’t have much else to write about this week.) and it passed. While I was running at MAF I had no pain but when I did the strides at the end I could feel it. Not enough to make me stop, but I knew that it was there. The good news is that I was able to run at MAF for the whole of the run, probably because the temperature has decreased in Tokyo, and I was able to maintain a fair cadence as well. Hopefully next week things will continue to improve and I will have something else to write about. This week was a tough week of training. I had several real life events that required my time and several hard workouts to do. At the end of it I am a little tired and glad that tomorrow is a rest day. I am also pleased that I completed the main workouts even if I could not make all the assigned paces all the time. Tokyo got hot and humid again and it was hard to run and each time I came back soaked. Especially on Saturday morning when a light rain turned into an all out thunder and lightening storm. I have been off coffee now for over a week. I am finding that I get a lot of reflux during the hard workouts and I am trying to try something to help me over come it. So far I have not had much trouble and it seems to have had some affect. At the very least I am getting better sleep. Monday was a rest day so I just came home and did my strength exercises. I was feeling tired after the long run on Sunday evening and my RHR and HRV were affected. The rest did me well and when I work on Tuesday morning my RHR and HRV were back in the game. That evening I had a real life event so I got out early in the morning and did my 8km easy run. The Tamagawa was absolutely beautiful in the morning and as it was the middle of Obon, it was not too crowded. On Wednesday I had another real life event. I thought about getting up early and doing my Hard Intervals at 5am but I was not confident I would be able to muster up the required energy at that time of the day. I decided to postpone the hard work until Thursday evening and went back to sleep. 800m @ 3:52 pace or faster (3:05 total time), jog back 400m in 3:00, then do another 800m in 3:05, jog back to the start with a rest time of 3:00 as well. Then on do another 800m in 3:05, rest for 30s and run 400m in 1:30 to 1:33 (3:45 ~ 3:52 pace). Do this twice. I programmed it all into my watch the night before as I knew that I could never remember all of that. As I had done the previous 2 weeks, I changed in the sports club in Shibuya and jogged over to Gaien to do the interval. It is 3.5km each way and I am beginning to wonder if I should find somewhere closer to change as the jog back after a hard workout is quite tough. I was totally soaked jogging back to the sports club and I was surprised that they let me in I was dripping so much. I had brought my swimming gear with me but I was too wrecked to swim and I just wanted to soak in the bath and head home. 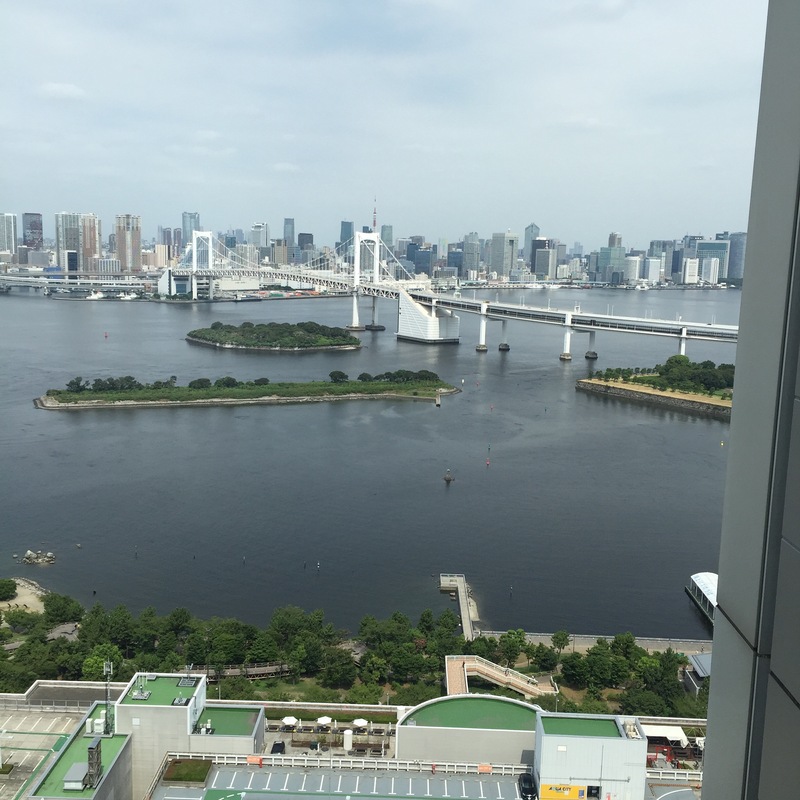 Friday was an easy day in advance of the hard hill repeats on Saturday morning so after work we just headed off to the Minato Ku Sports Centre and ran 8km over the Rainbow bridge. It was a nice gentle run on a summer’s evening and I felt fine after it. It was very tough again. I started the first squat and then turned and sprinted up the hill. As I got near the top I noticed that there was somebody standing in my way holding an umbrella. He was just where I would finish if I really pushed myself at the end. I cursed him for blocking the path but as I reached him I realised that it was Harrisson. Out for the second week in a row, this time in ever increasing rain, to help me get the exercise right. His first words to me were “which rep is this?” I guess it was too wet for small talk. When I had caught my breath, I told him that I had just started and rushed off to do the 60 seconds on the flat. I don’t think that I ever made 60 seconds at 3:30 pace after I ran the hill but I got closer and closer to the end of the road each time. I still had trouble keeping the isometric squat for 90 seconds and Harrisson advised to do them for 5 seconds at a time until I was able to get them right. It still was not easy and it was difficult to maintain pace on the hill and flat repetitions. 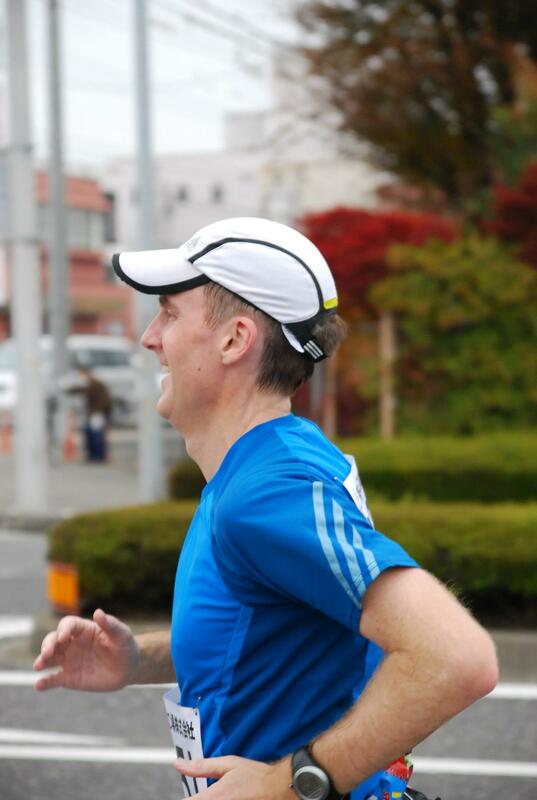 I had a little more success with the 400m at the Gaien loop completing the first one in 1:31 and the second one in 1:25. While we were at the Gaien loop the rain really came bucketing down and there was thunder and lightning. I really appreciate Harrisson coming out in it for the whole time and pushing me on. When I got home I realised that I would soon need to order my new running shoes for Ohtawara. I messaged my Personal Adidas Advisor Marie, and asked for a recommendation and if she knew where I could get a discount. She recommended several models and we settled on the Adizero Takumi Sen which was on sale on the Adidas website. I ordered the final size 29cm and they should arrive Wednesday. The trick now will be to break them in enough, but not too much, before the race. Merci, Marie! Sunday turned out to be a bright and beautiful day after the torrential downpour of Saturday. It was already 29 degrees when I started running at 8am and it just got hotter and hotter. Well at least that is the way it felt to me. I was running between Fireworks display sites. On Saturday night there was the Tamagawa Fireworks battle between Tokyo’s Setagaya Ku and Kawasaki’s Takatsu ku. As I reached the river, I could see that the cleanup was in full progress and I spent 2km dodging workman and volunteers with plastic bags cleaning up the rubbish. I have to say that I admire these people immensely. When I got up to Chofu I came across the other Fireworks display area. Chofu Fireworks were due to take place on Sunday night and part of my normal route was closed. I was diverted down a nice leafy green street with plenty of shade and I made a note to come this way again if the heat becomes too much. I managed to complete the run at an easy pace but I could not keep myself in MAF. It was just too hot so I gave up trying and just ran easy. That afternoon I went out for a 90 min cycle to Gasubashi with the boy. As luck would have it, we ran into Paddy with his son, also out for a cycle. We stopped to discuss the latest IOC scandal that the Irish had given the world before heading on our separate ways. It was a great finish to a great weekend. This was my first week back at work after my vacation and it went as well as can be expected. I managed to get in 6 runs and a couple of key workouts so I consider it a success. It was also very nice to meet up with Harrisson again and get some specific instructions. Monday was a rest day and just as well. I was being to feel tired from all the traveling and the hard repetitions on Sunday. On Tuesday morning I woke with a shock to see my HRV plummet and my Resting Heart Rate shoot up. My weight was inexplicably up as well. I put it all down to getting over travelling and dragged myself out of bed for a slow 8km before work. Wednesday my HRV, if not my Resting Heart Rate, was back to approaching normal but I was feeling very tired in my legs. I had the hard intervals that night around the Gaien Oval and right up to the point when I started I was wondering if I could do them. I thought that I might quit and try again the next day. Although I did not get to see Harrisson there as he had to work late, I did run into Yukiko, fresh back from Norway, right after I had completed my first set and I knew that there was no way I could quit. The plan called for 800m @ 3:52 pace or faster (3:05 total time), 45s rest, 400m @ 3:45 (90s total time), 3min active rest. Repeat 3 more times. I was able to manage the first 3 sets OK but after that I started to drift and by the end I was worn out and I limped back to the gym to clean up. Although I had had a hard session on Wednesday night, I had a good rest afterwards and my RHV and RHR were back to normal. Thursday was a National Holiday in Japan and I was able to rest during the day before going out for my run at 6pm. It was a nice easy run along the Tamagawa and I had a few strides on the way home. Friday was supposed to be a nice and easy run after work over Rainbow Bridge. However it did not turn out that way. I guess that I was eating too much in the afternoon and from the start I was feeling sick and a little dizzy. At the half way point I stopped for a sports drink and began to feel a little better. I slowly made my way back to the Minato Ku Sports Centre thankful that it was not worse. 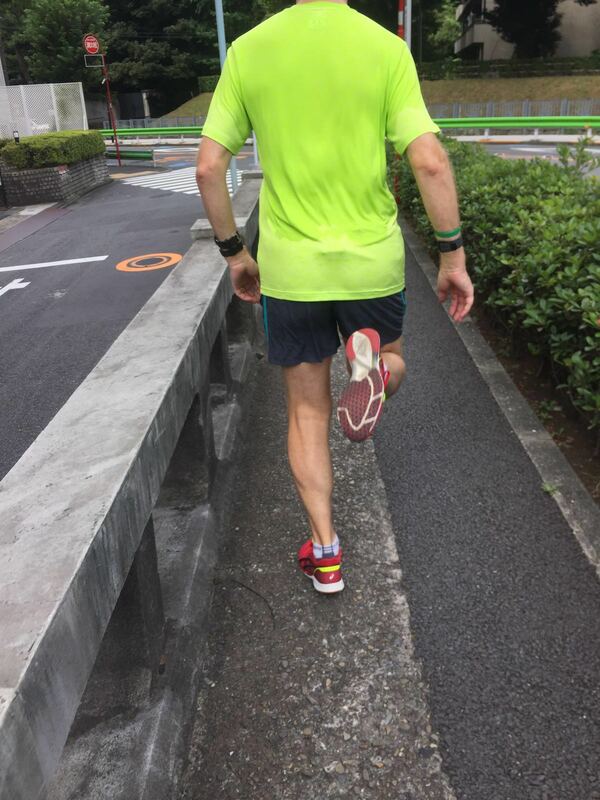 On Saturday morning I had arranged to meet Harrisson at the Akasaka Palace for the hard hill repeats. I had told him that I would meet him at 8am but I slept in until 6:45am so I did not get there until 9:30am. Actually sleeping in was not entirely unintentional. As I had not been feeling well on Friday night I decided to sleep for as long as I could, assuming that I would wake at 6am. The extra 45 mins were very welcome. The plan was for hill repetitions (8x60s) except that you will start each rep with a 90s isometric squats for the ﬁrst 4 reps, and 60s for the last 4. It was murder. I believe that the idea is to build up lattice acid in the legs with the squat and then practice running in that condition. It is very hard to run after a squat as I had discovered last week and much harder to run up a hill. My squats were terrible but fortunately Harrisson was there to help me out and take photos and videos. Eventually was able to do one half decently. The plan for today was to get up at 6am, do my 3 hour run and then bring the boy to Odaiba where Fuji TV was having an event with all his favourite anime, Dragon Ball and One Piece. Unfortunately I did not get enough sleep so when I woke at 7:30am it was already too late to start my run and even if I had we would be too late getting to Odaiba. I decided to swap things round and head to Odaiba first, take a nap in the afternoon and then head out for my long run around 6pm. The back up plan worked but I did far too much working around Odaiba and standing in queues. It can’t be helped and I put a brave face on it (I hope) and the boy enjoyed himself. Today’s run was 22km to 28km at MAF. Harrisson told me not to worry about completing the full 28km as I may be sore from the previous day but as I had missed the last 2 long runs I wanted to get one under my belt. As I was quite tired, I decided that I would just take it 1km at a time and try to get through it. If I felt sick or sore I would head back. As I was running MAF, the pace was not too bad. I just tried to keep my view at 25m in front of me and my cadence as close to 170 as possible. It all worked well and I made it to the turn around point without stopping for a drink. There I had 500ml of water and headed back. I stopped 3 times on the way back and only drank water. I was quite happy about that.